This is the Retirement Investing Today monthly update for the Australian ASX 200 Cyclically Adjusted PE (ASX 200 CAPE). The last update can be found here. The ASX 200 Price at market close on Friday was 4,709 which is up 1.3% from last month’s Price of 4,649 and up 10.5% year on year. The MSCI Australia Dividend Yield is currently 4.6%. I accept this Index as an ASX200 proxy for both Dividend Yield and P/E Ratio based on this analysis. The ASX 200 Earnings (calculated using MSCI Australia P/E Ratio and ASX 200 Price) are currently 304. This gives an Earnings Yield of 6.5%. The first chart today shows a historic view of the Real (inflation adjusted) ASX 200 Price and the ASX 200 P/E. 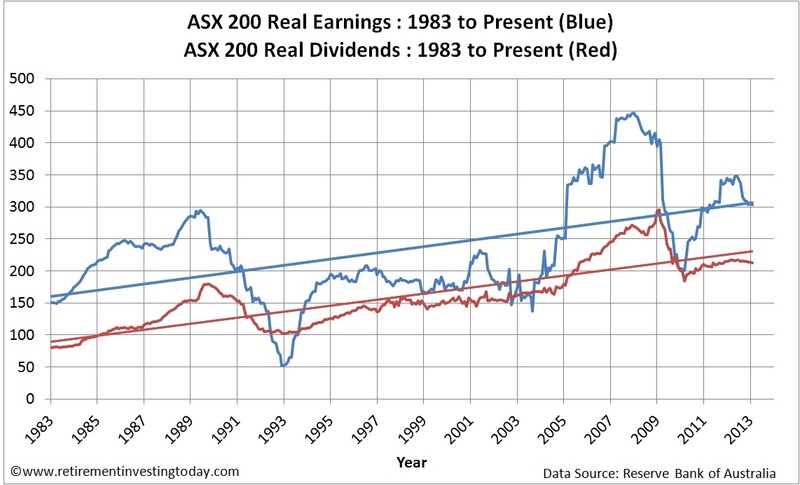 The second chart provides a historic view of the Real (after inflation) Earnings and the Real (after inflation) Dividends for the ASX 200. The first chart also shows a historic view of the metric that this post is interested in, which is the ASX 200 PE10 (effectively an ASX 200 cyclically adjusted PE or ASX 200 CAPE for short). The method is based on that made famous by Professor Robert Shiller and in this instance it is simply the ratio of Inflation Adjusted Monthly ASX 200 Monthly Prices to 10 Year Inflation Adjusted Average Earnings. ASX 200 PE10 is currently 15.1 which is above last month’s 15.0. 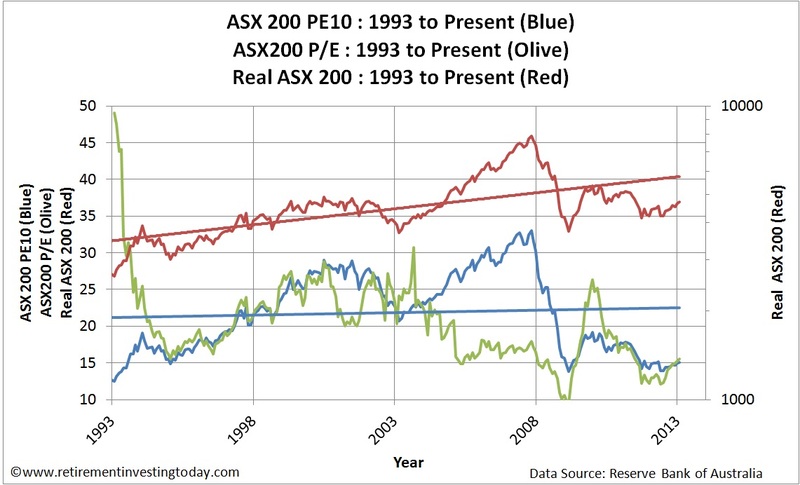 The Dataset Average ASX 200 PE10 is 21.8. If this average was “fair value” then it indicates that today the ASX200 is 31% undervalued. I’m not convinced of this though and think it is a result of a relatively short dataset but as usual I’ll cover that later in this post. The Dataset Median ASX 200 PE10 is 22.0. 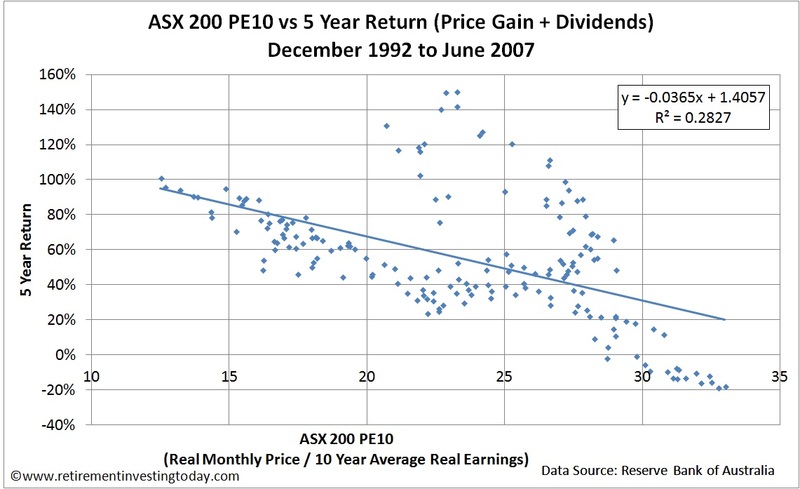 The Dataset 20th Percentile ASX 200 PE10 is 16.6. Dataset 80th Percentile ASX 200 PE10 is 27.4. My third chart shows why I use the ASX200 PE10 ratio as part of the tactical portion of my Retirement Investing Today strategy. This chart shows the ASX200 Price vs the Nominal 5 Year Total Return. The correlation is -0.53 with an R^2 of 0.28. With the ASX200 PE10 at 15.1 the chart trendline implies a future Nominal 5 Year Total Return of 86%. Even if I adjust this metric for inflation (not charted today) the trendline implies a real return of 67%. Finally, one problem this data has is that it is quite a short set. For my own investments I therefore now try and correct for this by making quite a large assumption, which is that there is a high correlation between Australian Equities and International Equities performance. With this assumption I then look at my mature S&P 500 dataset which tells me that since 1881 the average PE10 has been 16.5 and from 1993 it has averaged 26.5. Taking a ratio of these two PE10’s and multiplying by the current ASX200 Average PE10 I arrive at a “pseudo long run” Average PE10 of 13.6. Comparing that with today’s PE10 of 15.1 suggests the market is now 10.7% over valued and it is that data that I am making my own personal investment decisions on. Latest P/E ratio is calculated using the 11 January 2013 Price and the December 2012 Earnings which is extrapolated from the RBA’s published P/E. January 2013 Price is the 11 January 2013 market close. January 2013 Earnings and Dividends are assumed to be the same as the December 2012 numbers. Inflation data for October 2012 to January 2013 is extrapolated.